While computer gamers have long used gaming to interact with one another, build social connections, and de-stress, it’s now possible to contribute to scientific exploration while gaming. A new computer game called FoldIt encourages gamers to attempt to fold proteins into the lowest energy structure. [K]nowing the structure of a protein is key to understanding how it works and to targeting it with drugs. A small protein can consist of 100 amino acids, while some human proteins can be huge (1000 amino acids). The number of different ways even a small protein can fold is astronomical because there are so many degrees of freedom. Figuring out which of the many, many possible structures is the best one is regarded as one of the hardest problems in biology today and current methods take a lot of money and time, even for computers. Foldit attempts to predict the structure of a protein by taking advantage of humans’ puzzle-solving intuitions and having people play competitively to fold the best proteins. Already, gamers playing FoldIt have made scientific breakthroughs; it took gamers only ten days to solve the structure of a protein — specifically, a protein that helps the HIV virus to replicate itself — that researchers had been attempting to deduce for a decade. 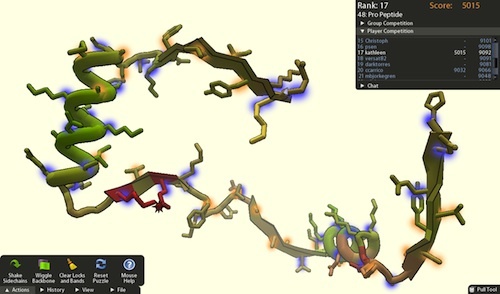 The strength of the FoldIt game as a mechanism for solving protein structure is that it capitalizes on the spatial reasoning skills of humans, which even highly advanced computers lack. Proteins are large, three-dimensional molecules, and while computers move through a long sequence of trials in an attempt to find the lowest energy structure, humans can use intuition developed through a shorter trial-and-error sequence. The competitive nature of the online game allows gamers to learn from the mistakes of others and combines intellectual resources.